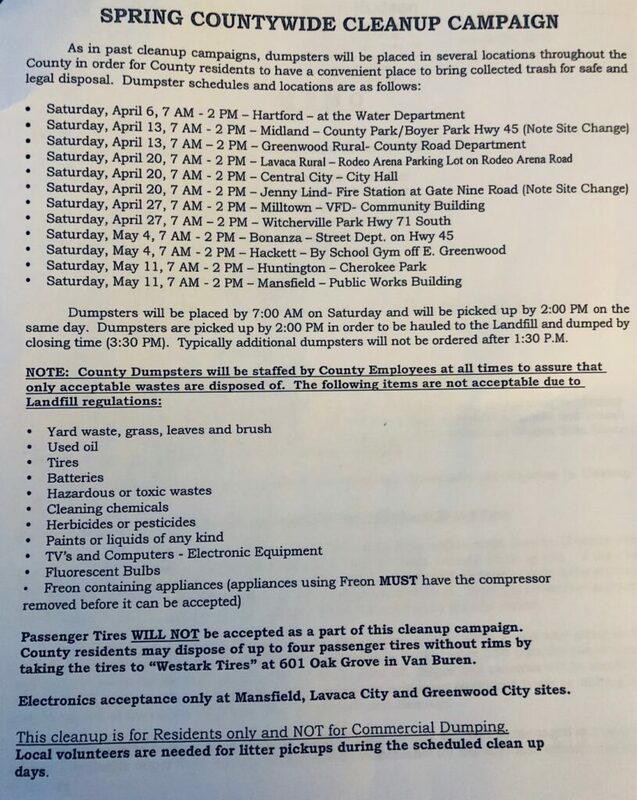 Sebastian County Judge David Hudson has announced plans for the spring cleanup campaign. According to Hudson, these cleanup campaigns are an opportunity to encourage community participation in cleanup activities. County staff will be onsite with a backhoe to help fully utilize each county cleanup site dumpster. Additionally, they will provide a trailer to load and dispose of any white goods (large electrical goods such as refrigerators and washing machines) and scrap metal brought to the site during the cleanup site hours of 7 a.m.-2 p.m. Previous Previous post: Lavaca High Students do well at FBLA State Conference.